John Singleton Copley undertook this monumental portrait of the Prince of Wales, the future King George IV, in 1804, without a commission, hoping it would secure him future royal patronage. The artist was in his mid-sixties and entering a final, tumultuous phase of his life and career. His recent contributions to annual exhibitions had been met with mixed reviews, and he remained locked in battle with his artistic peers over the management and policies of the Royal Academy, which he felt had been manipulated to his disadvantage. Such concerns were not purely theoretical, as Copley faced real economic difficulties in these years, anxiously jumping from one project to another in an attempt to bolster his finances and secure his fame. With just such an objective, around 1804 Copley presented a sketch for a proposed equestrian portrait to the Prince of Wales, who then promised to sit for him. Scheduling proved difficult, and the prince was not available to pose until 1808. In April of 1809, as the deadline for submission to the annual academy exhibition approached, the portrait was still unfinished. Copley requested an extension in the name of the prince, but his appeal was promptly denied, further alienating Copley from his fellow academicians. In August 1809, nearly five years after first conceiving of the portrait, Copley finally declared the work complete. Copley had once defied convention by creating a large-scale history painting about a contemporary event of personal rather than national significance (his 1778 Watson and the Shark [89.481]), but the format he chose for the prince’s portrait is deeply traditional and conservative. It looks back almost two centuries to examples of royal equestrian portraits by such admired masters as Anthony van Dyck and Peter Paul Rubens. 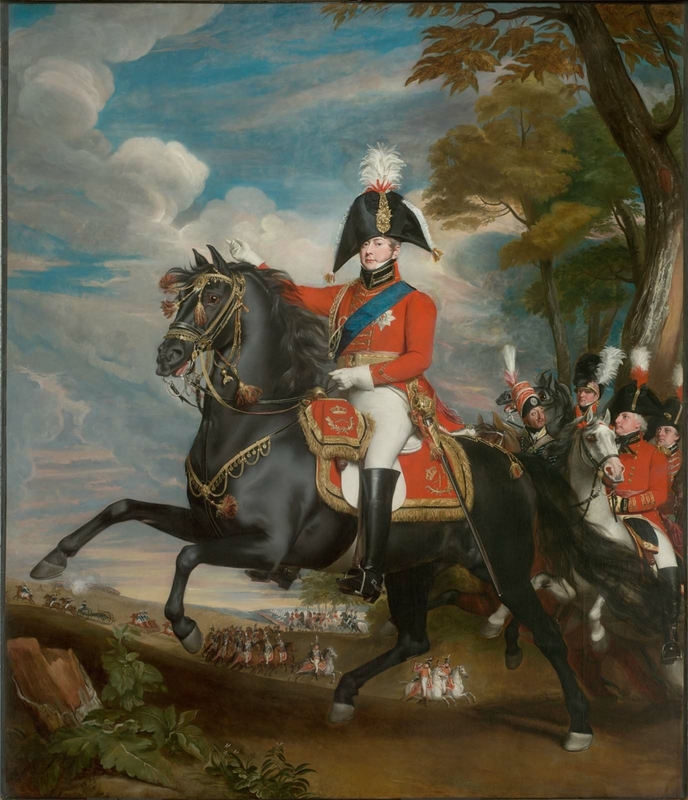 There were contemporary comparisons to be made as well, including William Beechey’s recent portrait King George III Reviewing the Prince of Wales’ Regiment of Light Dragoons, Attended by the Prince of Wales, the Duke of York and Other General Officers (about 1794, Sterling and Francine Clark Art Institute, Williamstown, Massachusetts). All of these depictions feature the royal subject on horseback, front and center, reviewing some military action. Copley’s composition follows this long tradition and is replete with the customary indications of the prince’s exalted status. Copley presents the Prince of Wales gesturing into the distance toward a cavalry regiment named in his honor, the 10th Prince of Wales’s Own Regiment of Light Dragoons. As indicated in the painting’s full title, the prince is joined by four military leaders, including Captain Baron von Eben of the 10th Light Dragoons; Lieutenant General Lord Francis Augustus Elliott, Second Baron Heathfield; Lieutenant Colonel Benjamin Bloomfield of the Royal Horse Artillery; and Brigadier General Tomkyns Hilgrove Turner. Colonel George Augustus Quinton (or Quentin) can be seen in the middle distance, at the head of the hussar troop that appears between the prince’s horse’s legs. Despite his great efforts, Copley was unsuccessful in securing royal patronage and this portrait remained unsold during his lifetime. It stayed with Copley’s son, who served three times as Lord Chancellor of Great Britain and was named Lord Lyndhurst in 1827. At the 1864 sale of Lord Lyndhurst’s collection, another member of the artist’s family acquired it, eventually bequeathing the portrait to the MFA in 1925. For all its frustrations and failures, the painting remains a tribute to Copley’s ambition. In the last years of his life, in poor health and poorer spirits, he nonetheless challenged himself to create a grand royal portrait in the high manner of master painters like van Dyck and Rubens. 1. Quoted in Jules David Prown, John Singleton Copley, vol. 2 (Cambridge, Mass. : Harvard University Press for the National Gallery of Art, 1966), 379. 2. Christopher Bryant to Karen Quinn, January 21, 2011, curatorial files, Department of Art of the Americas, Museum of Fine Arts, Boston.